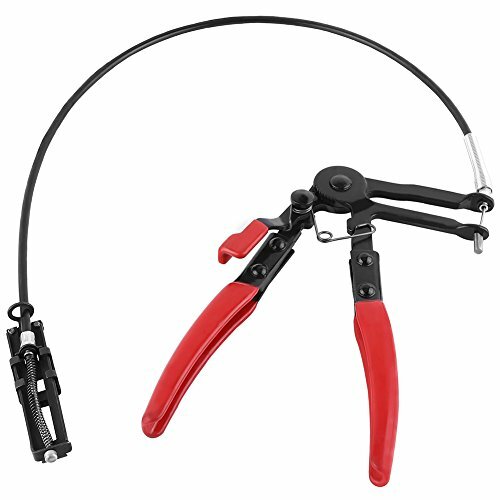 Practical flexible hose pipe clamp plier to make removal and installation of clamps much easier. Allows technician to access the flat-type hose clamps located in hard-to-access areas. Heavy-duty cable flexes to almost any positions. Plier has ratcheting and locking mechanism to hold clamp in the open position. Ergonomic designed handle, comfortable to use with little effort. Suitable for 1.8-5.4cm diameter clamps, provides convenience of replacing fuel, motor oil and water hose or pipe. Great for working in confined engine bays.